BELLEVILLE – With a little help from the public, Quinte West Ontario Provincial Police have found weapons used in a Trenton Mac’s Milk robbery. 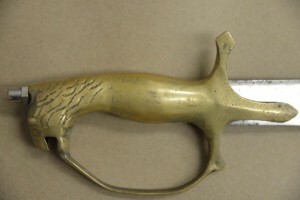 The OPP say two weapons were found, one a sword with a brass handle in the shape of an animal head. Police did not identify the other weapon. Both weapons were used during the robbery that took place on Oct. 28 on the corner of Dixon Drive and Byron Street in Trenton. Now OPP are asking for more help to track down the two suspects. Anyone who may recognize the sword is asked to call Quinte West OPP at 613-392-3561 or Crime Stoppers at 613-969-8477.